Healing is often talked about in Pagan or New Age communities but often any purposeful action behind the words is missing. Sometimes, we all need a little extra help in becoming healthy – whether it’s physical, mental, or spiritual health in need. This ritual is an excellent tool to give the participants some extra healing energy while also helping to refocus their minds on what they need to heal. I’ve recently mentioned the Irish goddess of herbalism, Airmid. The idea is to invoke the spirits of Airmid and her brother Miach to help send healing energies to ritual participants. I considered writing a short post just about Airmid for anyone unfamiliar with the goddess/faery healer, but I decided that it would be difficult to beat the classic essay by Erynn Rowan Laurie from Issue 25 of Sagewoman. Click here to read it. 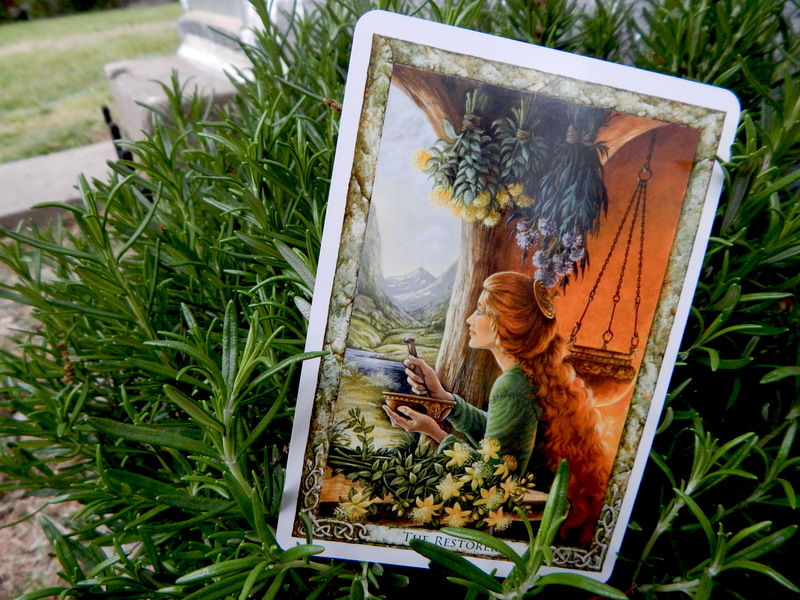 An herbal healer as shown in the Druid Plant Oracle deck. Image copyright – Will Worthington. Attendees bring a sprig of fresh herb or small sachet of dried herb, taking turns explaining what the herb’s use is spiritually and physically, and then sews it onto the cloak that is on the center table. When the herbs have been sewn on and the cloak blessed, the cloak is used to direct healing energies to the participants. After this, you can add a seasonal celebration before the cakes and ale if doing this at a sabbat. I often do this at Midsummer and honor the Sun with a game of roll-the-hoop or something similar within the ritual circle. I’m not fond of scripted rituals. I prefer that participants know the outline and concepts behind the ritual and simply deliver the words that feel right at the moment. The following ritual does provide wording for different things, but feel free to just read it, learn the gist of it, and present it in a way you enjoy and makes you comfortable. Set up a ritual table in the center of the circle that is clear of all objects except a needle, thread, and snips or small scissors. You can place the cloak on the ground and sew the herbs on that way, but a table makes it easier, especially if your knees aren’t what they used to be. Another table should be set up on the edge of the circle for a chalice or small cauldron with whatever you use as holy water, smudge, god & goddess or elemental items/offering plate, and cakes and ale. Cleanse the space with your preferred method. I typically sain the area by sprinkling what I consider holy water: moon-charged water with 9 drops of Chalice Well water added in. The ritual leader can conduct the entire ritual by his or herself, or split into two parts for a high priest and priestess. You can assign parts to others as desired, particularly the quarter calls. If you have a great storyteller in your group, you may assign them the task of learning and telling the story. Another possibility for a group with at least four people comfortable with acting out sacred drama is to act out the story of the physicians, with roles for Airmid, Miach, Dian Cecht, and Nuada. As I’ve discussed before, sacred drama can make a ritual amazing. Smudge participants and enter into the circle as normal. Use these simple quarter calls or whatever ones you prefer – depending on who is in the ritual, I will sometimes substitute quarter calls with honoring the Realms of Land, Sea, and Sky from the Celtic cosmology. Air (east): I call to the spirit of Air, breath from the east. Fire (south): I call to the spirit of Fire, energy from the south. Water (west): I call to the spirit of Water, blood from the west. Earth (north): I call to the spirit of Earth, flesh from the north. If you wish, you can add the common chant, “Earth my body,” at this time, doing it multiple times to build the energy. Here the facilitator summarizes the story of the physicians as desired. See the last blog post to learn the story. Ritual Facilitator: I ask that the spirit of Miach join us in our circle. May his selflessness and desire to heal and be healed be reflected those here today. May his wisdom and skill be infused into this world for the healing of all. So mote it be. Ritual Facilitator: I ask that the spirit of Airmid join us in our circle. May her desire to harvest and to sow healing wisdom be shared among those here today. May we continue to learn her healing secrets so her tears are not wasted. So mote it be. Ritual Facilitator: Now, we will take turns stepping forward to share our own herbal knowledge and to imbue this cloak with healing power. Participants take turns stepping forward, explaining their herb’s powers, and sewing it on. It is a good idea for one of the ritual organizers to start this off to help others be more comfortable in knowing what to do. An example is,“I bring plantain, a wild-growing herb good for healing the skin and small wounds.” After all the herbs are sewn onto the cloak, dedicate the cloak. Ritual Facilitator: Now that we have brought forward all the healing herbs available to us, we will now dedicate this cloak to healing. Though we do not have their healing well, we will sprinkle holy waters from this sacred chalice onto the cloak. Facilitator takes the chalice and sprinkles water from it onto the cloak. Ritual Facilitator: May this simple cloak be imbued with the healing power of Airmid and Miach so that it may facilitate healing for us all. Now, I will bring the cloak to each of you and place it around your shoulders. When you are done receiving the energies, remove the cloak and return it to me. Go around the circle and put cloak on attendees one at a time, keeping your focus on the healing for each individual. Sometimes it will be physical healing they desire, but other times a spiritual or mental healing – try to be grounded and supportive in your energies as you take the cloak around the circle. After you’ve gone all around the circle, you can add a chant or toning that you feel focuses on healing – or use sound vibrations like that from singing bowls or gongs, which are becoming better known for healing work. I was trained to use a toning that goes: E-A, E-A, E-O. Each vowel is toned individually and held for a long as possible. You can use anything you wish. At this time if you want to do a seasonal observance, do so. Ritual Facilitator: We thank the spirit of Miach for joining us. May his story continue to inspire us on our healing journey. Blessed be! Ritual Facilitator: We thank the spirit of Airmid for joining us. May her wisdom and dedication to healing continue in us. Blessed be! Air (east): We thank the spirit of Air, for breathing new life into us. Blessed be! Fire (south): We thank the spirit of Fire, for re-energizing us. Blessed be! Water (west): We thank the spirit of Water, for cleansing us. Blessed be! Earth (north): We thank the spirit of Earth, for regrounding us. Blessed be! Well, that’s it. If I’ve left out anything or if you have questions, feel free to ask in the comments and I’ll answer a soon as possible. As we are between the Vernal Equinox and Beltaine, we are heading into prime time for this ritual, though it could easily be done through early fall in most regions. I never knew 19 years ago that someday having a stockpile of herbal tinctures would make me feel witchy. Them. The older Pagans and Witches that I remember from my early days on the Pagan path. Those that would nod encouragingly but with a smile hiding at the corners of their mouths as I relayed my early endeavors with the elements, meditation, and such. They were always supportive, but now I understand the smile tugging at the corners. Meeting folks new (or old) to the path is always a pleasure – we are always eager to share what we’ve learned with others and trade suggestions. But after almost 20 years, I’ve heard those same early experiences so many times that I can’t help but smile a little now too. But like the elders I looked up to, I wouldn’t dare act like it’s not a big deal because it is a big deal. Some recent experiences like this made me think of the evolution of witchy-ness that I and many folks that I know have experienced. Anybody else remember when they were a bright and shiny witch or pagan? That giddy feeling from buying the first few books or magazines? That so-anxious-you-might-puke sensation at your first ritual? I remember when getting a subscription to Sagewoman magazine felt like a big deal, and being given a tarot deck was HUGE (yet kept hidden in case my mother saw it during a visit). Over time, things became more elaborate and my above-average memory came in handy to remember the order of a ritual as well as the chants, the correspondences of herbs and stones, and folklore and mythology. As the years went by and ritual participation moved into ritual writing and leading classes, what also made me feel witchy changed quite a bit. As experiences became more richly woven, they often became more complicated as well. After a few years, I found myself wanting to focus more on building my own knowledge of applicable skills like herbalism and sustainable living. To strip away the excessive elements of the practice and be creative in a different way. I made a few teas, soaps, infused oils, and bee’s wax lotion bars as I started to experiment. 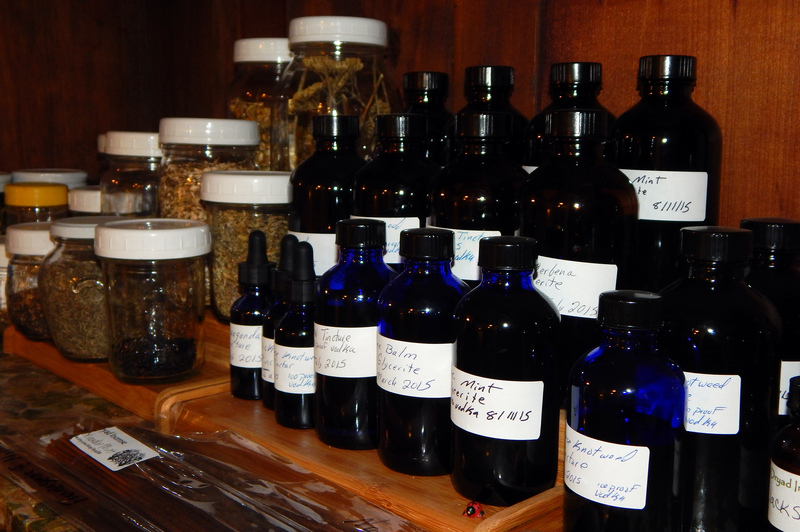 A year and a half ago, I started taking herbal classes, most of them lead by an herbalist from The Golden Light Center in Missouri, and this expanded my knowledge and confidence in using herbs more than traditional spell work ever did. 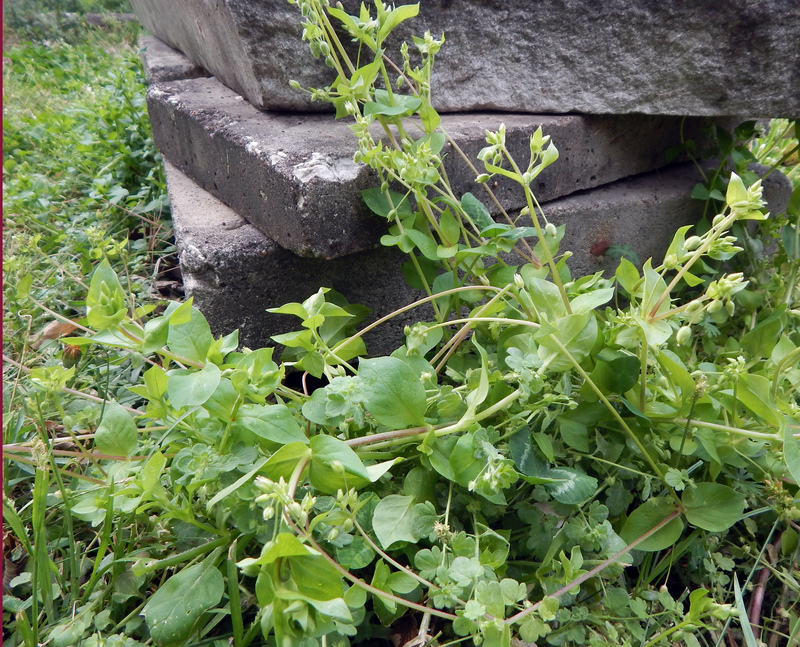 Harvesting my own herbs – like this chickweed – for herbal tinctures and tonics has proven rewarding. Last summer and fall, I concocted more than a dozen different tinctures and glycerites, a few of them even from carefully wildcrafted plant materials. There was lemon verbena and mint glycerites for upset tummies, Japanese knot weed tincture for Lyme’s disease prevention and treatment, horny goat weed tincture for those certain performance problems, and even mimosa tincture for dealing with mild depression. And as I started to share and trade these with friends, I found myself feeling more witchy than I ever had before. I felt a connection to those who came before me and used their knowledge – whether it was knowing the magic of herbal healing or using herbs magically (or other items and skills). Looking back at this, I think it is similar to learning how to draw realistically before going into abstract art – learning to use herbs for physical health feels like a foundation for magical use of herbs, if that makes any sense at all. Even months later, when I look into my magic cabinet where I now keep the herbal medicine along with my assortment of candles, crystals, and other items, I feel a creative spark and a power I’ve never known before. Of course, I’ve felt connected to the Irish fae/goddess Airmid for years, but now that connection is forged by action and not just an ideal. Now, reading the charm, “bone to bone, vein to vein, balm to balm” takes on yet another layer of meaning – the passing on of knowledge from one person to another. To heal using nature’s divine bounty, just like that dutiful goddess tried to even when her father’s ego got in the way. Usually, I have a good idea of where a post is going when I start it. Not so with this one. Perhaps it’s to see if others out there have had their own evolution of witchy-ness. Maybe it’s just to give beginners an idea of why the elders sometimes look amused – or just to remind the elders not to feel superior just because their beginning lessons were 20, 30, or more years ago. We all must break down and analyze our practices now and again, starting anew to some degree. Any well-lived life is an evolution of sorts, so why should a magical practice be any different when it affects our lives so much? OK, enough rambling for the night – please post your own ideas about changes of magical practice if you wish. Until next time, blessings to you all!